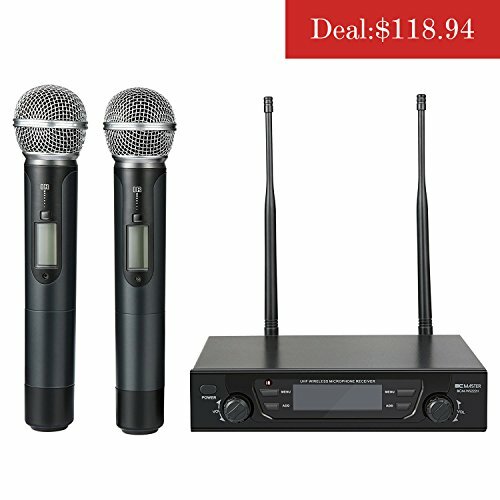 BC Master BCM-WS222H Wireless Microphone System with 2 Handheld Mics that is ideal for church, various parties, conferences, happy karaoke nights, presentations and so on. The wire-free design allows you to go further than you would with a wired microphone and without the cable trailing along the floor. It gives you a greater freedom of movement without getting tangled in the wire as you do so. This makes the microphone perfect for use when presenting to an audience. The working distance of this product is about 190-260Ft/60-80m In wide-open area as the test of our professional and technical personnel, maybe there will be some small errors but not much. If there are walls block, distance may be shorter. In the case of moderate volume, life of batteries which are included is about 14 to 17 hours, if you don't use it for long time, please remove the battery to avoid damage of the product. Note: The battery maybe ware out when you put them into the microphones, but please don't worry, it's just because the volume is a bit big, It does not affect the use. 1. You will need an extra audio equipment like speaker to connect with this product to make the sound working. 2. Please keep the receiver away from the metal or any digital devices (such as computers, cellphones, etc.) to avoid potential sources of interference. 3.The receiver should be more than 1m from the ground. Please avoid to be against a wall. 4.Please do not use the microphone facing the receiver too closely, in order to avoid noise interference. 5. Please do not flap the microphone head with hand, or it would be damaged. UHF (Ultra High Frequency) wireless microphone with special band design frequency. Multi-channel digital phase locked loop DPLL frequency synthesis technology to provide up to 40 channel selections(645-684mHZ). If you have any cut out, then you need find a right frequency, when you couldn't find it, please contact our support email any time. Microphones are equipped with anti-shock ring that feature stable for church, birthday or family party, conference, classrooms, small karaoke night ecc. LCD display shows group and channel settings. It makes the operation quick and simple. If you have any questions about this product by BC Master, contact us by completing and submitting the form below. If you are looking for a specif part number, please include it with your message.